Kendra hasn't felt safe since devastating memories of childhood sexual abuse began surfacing, especially because she still can't remember the most important detail-her abuser s identity. Someone is always watching Kendra, following her and leaving menacing messages, and making her fear for her life. Kendra cuts to relieve the pressure: it s how she copes, along with her brilliant expressive artwork. Her mother is too self-absorbed to listen, so Kendra finds support elsewhere: from her therapist and her art teacher, from Sandy a family friend, and from Meghan, a friend and maybe more. Will they ever learn the truth about Kendra s terrible secret? 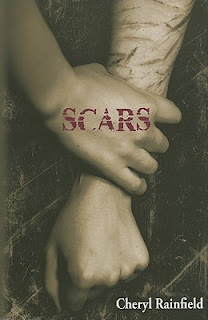 Scars is the story of one one girl s frightening path to the truth. WARNING: This book (not the review, however) can be triggering for anyone that has dealt with self-injury or sexual abuse. This book was amazing. Cheryl Rainfield does an amazing job at telling Kendra's story. Rainfield's writing, at least in this book, is incredibly powerful. Her choice of language, especially during the parts about self-injury were real and raw. I was able to feel Kendra's pain and my heart broke for her. After the identity of the abuser is revealed, I had to take a couple of moments away from reading because I felt sick. Many times, especially towards the end of the book, I had tears in my eyes. I devoured this book once I sat down to read it. Even though I mentioned that this book can be triggering, the ending was one of hope. It wasn't an ending of perfection and rainbows and butterflies, but hope... hope that one day, even after all the struggles we've been through, things will finally be okay.